It’s easy to sit at home and scoff about Doomsday Scenario statements from the leader of Preston’s council as reported in the Evening Post. Today’s comment about the Guild Hall being on the agenda for cuts or even knocked down sounded dramatic and it can’t be certain if it was posturing against central government or positioning for the bus station debate. The suggestion of bringing in an entertainment company to run the Guild Hall is similar to Blackpool where the council brought in Merlin Entertainments, operators of Madam Tussauds, to run the Tower. Sounds reasonable, if possible. Given that the Guild Hall is Preston’s only large entertainment centre it’s unlikely to be knocked down. Although the Guild Hall isn’t a place I’d suggest anyone goes to have a look at, like the bus station it has a very tired look and suffering from that gap between fresh and old. 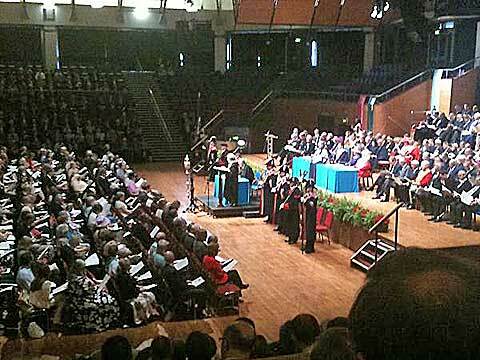 Preston Guild Hall, the Preston Guild ceremony 2012. The council say the settlement with central government is another big reduction and something must give. Without being an expert on council spending it’s hard to comment, but the buildings being discussed have been there at least 40 years and weathered worse storms than the current recession. Why is it that this time buildings are being knocked down. It is logical to review all services and buildings and that is what they’re doing. There are a lot of empty buildings in Preston that many citizens would like to be looked after, the old post office and Mount Street for example. Hopefully the answer will not be a dull politically motivated announcement. An assumption of better times to come should dictate the answers. This entry was posted in Made in Preston, Political, Uncategorized. Bookmark the permalink. As an ex-Prestonian having emigrated to the USA in 1964 and having returned to Preston for vacations quite often, just last September 2012 for example, it is when one has been away for a while that one notices the change s in the city, like seeing an old friend after a few years away. I’ve read and heard talk about this and that wich needs to be changed and often wondered why ? There is such a lot of talk right now about the bus station being razed and quite frankly it is a rather awkward spot with limited access and a disgusting tunnel to get to it and out of it. Luckily I have hardly ever had to use it but I can see from the odd times I have used it what a bit of a mess it is. So consider this…….Preston has two covered markets and a flag market and an emply ex Post Office. The markets are, well in a word, “ancient”. Yes ancient, a relic of Preston Past, never to be used again for what they were originally built for. Now nothing more than a great big flea market, a car boot sale and the like. Here’s the plan then. If the bus station is to come down then let’s turn the three market’s into the new bus station and the old Post Office as the bus station offices. There couldn’t be a better, more convienient location with several easy access roads all around it. Now come on Preston, think about it and get on with it. Job done. Hi David, I read your previous post. The covered markets are said to be the biggest unsupported Victorian structures in Britain. They are still used for markets and those with a bent for retaining old while aspiring for the future want to keep them. Because there is a recession now and trade is down doesn’t mean it will always be that way. It is a worry that infrastructure is being allowed to rot so that recovery will cost a lot more. Like the missing roof tile will cost £50 to fix now and £5000 in a few years.